A few months ago, Dead Stars self-released their new single “Calm Punk” to universal praise from some high profile media outlets including Noisey, CMJ, Diffuser and others. It was nice to see this excellent band and trio of good guys finally get some love — we have been onto them for a few years now. They played our CMJ show two years ago and also a criminally under-attended show we put on at Cameo Gallery a few months after that. But truth be told, we had not seen Dead Stars live in over a year and welcomed the chance Friday last at Rough Trade. Although the band was in a supporting slot, the crowd involvement was exceptional — we’d guess a large portion of the audience was actually there to see them. The result was a high energy forty-five minute set of Dead Stars’ 90’s influenced guitar god rock, which also included some fun banter and crowd interaction. We are streaming this set’s performance of “Calm Punk” below. Dead Stars play Rough Trade again on August 1, opening for Lazyeyes. I recorded this set with the Schoeps cards mounted inside of the soundboard booth and mixed with an excellent feed provided by house FOH Dustin. The sound quality is superb. Enjoy! 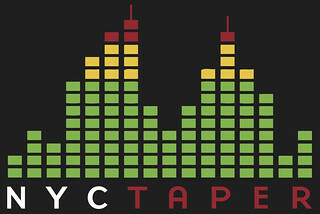 If you download these recordings from NYCTaper, PLEASE SUPPORT Dead Stars, visit their Facebook page, and purchase their official releases including the “Calm Punk” single and their album Slumber from their Bandcamp page or from Old Flame Records [HERE]. Thank you so much! This recording truly captures their live sound, on an especially rocking night. Cheers!